If your client has breathing difficulties, you will probably need to avoid inductions or suggestions that involve taking deep breaths or focusing too much on their breathing as this can cause them to panic. 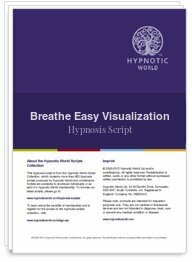 This Breathe Easy Visualization hypnosis script enables the client to find their own pace as they take themselves into a deeply relaxing state. The script includes an anchor to remind them of how to breathe when not in hypnosis, together with a scenic visualization to help your client to relax. This script can be used as a stand-alone approach or you can use it as an induction and deepener, adding appropriate suggestions at the end, if they are seeing you for issues other than their breathing.